How to set or update Linux user password in a script ~ Your Own Linux..! 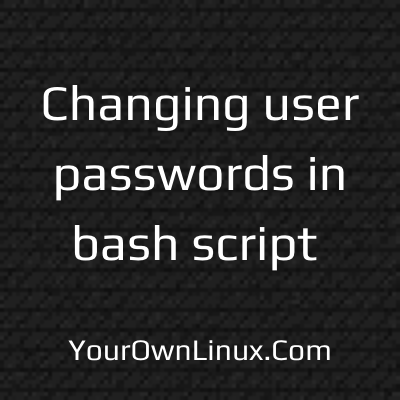 Change or set a Linux user's password non-interactively. Consider a scenario that you have to create multiple user accounts with a default password on a server. I can use passwd command, but it expects user input through stdin. So, it is certainly not handy when you have to create hundreds of user accounts and set their passwords, as one has to enter the same password twice per user multiplied by the number of user accounts to be created. A better approach to set a user accounts password is to use chpasswd command. This command is used especially when you have to create multiple user accounts and set/update their passwords in a batch. It reads user-password pair from stdin in userName:newPassword format and changes the password of user account userName to newPassword. Alternately, you can mention usernames and passwords in a file in userName:newPassword format, one pair per line, and feed that to chpasswd command. 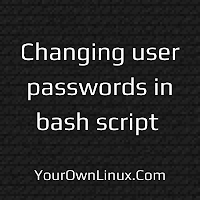 You can use any of this tricks in your script to automate changing or updating Linux user account's password. Try and let us know how it goes for you.